Greg Mills is confident Corby Town won’t be fazed by the big crowd that will be on hand when they head to FC United of Manchester on Saturday. The club formed by fans of Manchester United following Malcolm Glazer’s takeover at Old Trafford in 2005 have gone from strength-to-strength in recent years and, like the Steelmen, earned promotion to the Vanarama National League North last season. They have maintained a big following and have had just one attendance under 3,000 in their four matches at their new Broadhurst Park home so far. 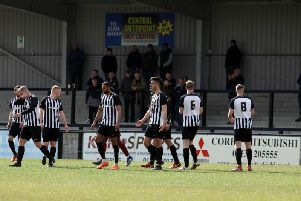 But Corby frontman Mills, who scored from the penalty spot to earn his side a 1-1 draw at Gainsborough Trinity last weekend, is adamant he and his team-mates won’t buckle in the red-hot atmosphere. And he believes their experience of winning the Evo-Stik Southern League Premier Division title in a last-day showdown at Poole Town last season will be useful when they step out on Saturday. “We are playing the club that most would regard as being the biggest in the league,” Mills said. “Everyone knows about the FC United story and there’s no doubt that when the fixtures were released, this was one all of us looked for straight away. Everyone wants to play in front of the biggest crowds possible. “I don’t think a big attendance will faze us. The vast majority of us played in the game at Poole last season and that was with the title at stake as well so we have shown we can cope with the pressure of playing in front of a big crowd. “There was a lot more riding on that game than there is on the one on Saturday and, in terms of the league, this weekend is no more important than the last one and the ones that follow it. “We want to do well in every game and it will be tough because they, like us, have had a steady start to the season after coming up. “But I am sure we will go there and give it a real go. We are an attacking team and our fans and manager want to see us doing what we do best. Mills, meanwhile, has been pleased with his own form so far this season and believes the hard work he put in during the summer has already paid off. “The manager has already talked about it this season but I worked really hard during the summer and I came back fit and it’s pleasing to know that work has paid off,” he added.